When I arrived at the Sangster International Airport in Montego Bay, I picked up my luggage and went to the Sandals lounge to check in for my shuttle. The lounge's decor was bright and they had light refreshments, which I greatly appreciated after traveling for 8 hours! A porter transported my bags to the shuttle after a short 15-minute wait. He also made sure to very politely say that he's not a part of the Sandals staff (i.e. tip, please). The shuttle ride was pleasant - it was well air-conditioned and the driver was super friendly and gave us a lot of great history about Jamaica. We were all eager to get to the resort, so we didn't take a rest stop. According to my shuttle driver, Beaches is advertised as being in Ocho Rios for marketing purposes but it is actually a couple of minutes outside of the city. To get to Ocho Rios from Montego Bay is a 1.5- 2 hour shuttle ride. We were welcomed by friendly concierge staff who grabbed our bags and delivered them to our room. While checking in, I was offered champagne and a staff member escorted me to my room to complete registration on an iPad. 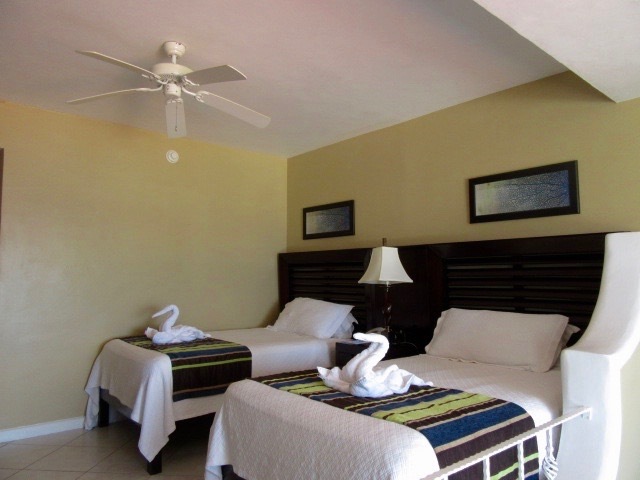 We stayed in a Caribbean Luxury Family Sized Suite Double. It was an air-conditioned room with two double beds, a double pull-out sofa bed, and a cot. We fit four people comfortably. The wi-fi in the room was free and had a strong signal. My favorite part was waking up to the beautiful view of the hotel grounds with the ocean as a backdrop. Be mindful that the room key card is extremely sensitive and will deactivate when next to your phone. I was really disappointed with the food and drinks. I tried 4 out of 7 specialty restaurants on the resort and thought 2 of them were decent. I recognize that the resort has to cater to people from different origins who may want food they are familiar with. However, when I travel to a country, I want to eat their local cuisine and not items I can find at home. My favorites were the Bayside Restaurant, which had buffet-style breakfast and lunch with a few traditional Jamaican dishes on the menu, and the Out of the Blue, which was a pop-up bistro that featured seafood with a Caribbean flare. Also, I'm convinced that when Beaches said all-inclusive food and drinks, they meant all-inclusive food and bottom shelf drinks. I'm not a big drinker. I like to say I have a cost-effective tolerance - after 2 drinks, I'm good for the night. But I travelled with people with a higher tolerance and they complained about getting headaches from drinking the cocktails. Get off the resort for authentic food! Scotchies was recommended to me by a friend and a bunch of locals. I had the best jerk chicken in my life there! That $7 meal was the culinary highlight of my stay. Horseback riding in the water on the beach is something I've been wanting to do for a while. We started our day at 8:15 am for our guided tour on horseback with Hooves Jamaica. I highly recommend this company for your horseback riding experience. The staff is very friendly and knowledgeable. They carefully select a horse for you based on your size, help you mount the horse, and give you a brief orientation on how to control the horse. The tour began with a 30-minute trek through a forest, which led to the 15 minute trek on the beach and in the water. While at the beach, we received complimentary home-made limeade and plantains which were AHHMAZING. I really respected how they gave the horses a break to eat and relax before going into the water. The beach riding part was a little anti-climatic for me. I was with a group of 6 and while in the water, multiple horses ahead of me pooped, so I spent a lot of time trying to dodge poop from touching my leg. Floating poop on my leg was not in my horseback riding on the beach day dreams! But besides that, I really enjoyed myself. I learned that typically people horseback ride with long pants on, but alternatively you can use a towel to sit on. Also, don't forget your sunscreen and insect repellant. I talked to many locals and asked them about the must-see places near Ocho Rios, and they all recommended visiting the Dunn River Falls. After the horseback riding tour, we came back to the hotel for lunch and headed to the falls at 2pm. This was one of my favorite traveling excursions EVER partly because of the people I enjoyed this with. This was my first international family vacation and it was my mom's first time out of the country. She's never done anything adventurous like climb up a waterfall! She didn't know what to expect and when she saw what we had to do, she gave me the "I'm gonna kill you eyes" but ended up really enjoying it! There are several levels to the falls and at each level you can exit if you choose to. But my mom made it to the top level. Go Mom! I also went with my cousin and my 10 year old nephew who was oozing with excitement (see picture above). He told me, "Auntie, this is going in my favorite memories ever book stored in my head". My heart melted. Long story short: don't leave Jamaica without visiting the Dunn River Falls! You can choose to do a guided or unguided trek up the falls. I highly recommend going with a guide. The guide pointed out several dangerous spots that you should avoid stepping on. Also, do not buy the "personalized video" they sell to you at the end. My cousin and I got a deal to get two DVDs and my DVD just included the history of Jamaica segment and her DVD only had 3 video clips of us. This was my first travel swindle of 2017! Luckily, I asked my guide to take pictures of us throughout the excursion and got really good shots from him. I propose you just tip your guide to take pictures of you or get a Go-Pro or a reliable waterproof case to take pictures yourself. I am not a resort type traveler, but I must admit it was an unique experience. The resort grounds at Beaches Ocho Rios are stunning and interacting with their charismatic and helpful staff was a pleasure. Although, the resort was advertised as having something for everyone to do, I felt that most events catered to children. As a single person with no children, I wouldn't return the Beaches Ocho Rios resort. Right now, I highly value good authentic food and drinks and I wasn't fulfilled with either. However, I would return later on in life when I have children because they did a great job catering to them. Also, because of the superb customer service, I am definitely open to experiencing Sandals adult-only resorts. 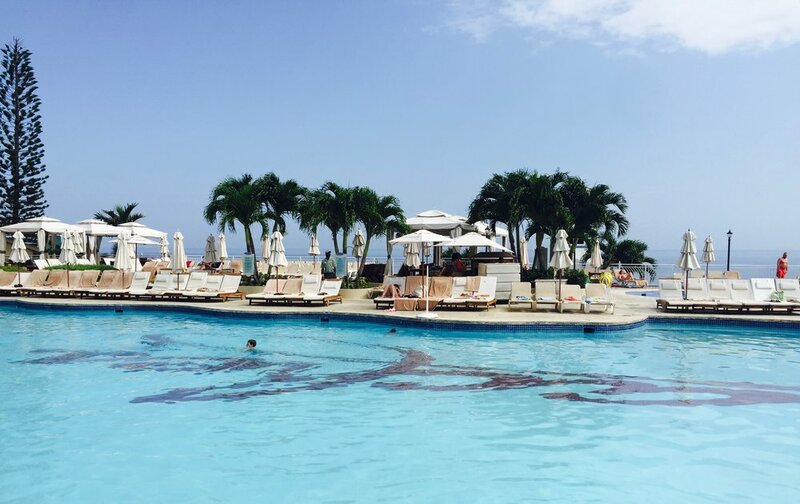 Have you ever been to a Sandals resort? What was your experience?